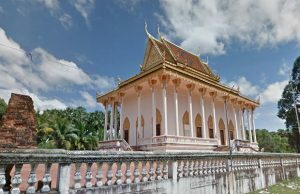 Phnom Krom Hilltop Temple is the big hill that you see near the landing if you head to Siem Reap by bullet boat. 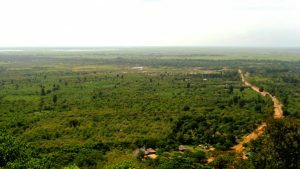 The hilltop area provides magnificent panoramic views of the Great Lake Tonle Sap, the surrounding countryside and Siem Reap town. The commanding view of the lake was used for a more practical, albeit more deadly, purpose in the fairly recent past as evidenced by a big gun mounted on the side of the hill and pointing toward the landing part of the Great Lake. 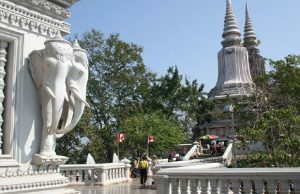 A modern-era active temple shares the hilltop with the temple ruins of Phnom Krom. There are seven crumbling towers among the ruins in two lines, with four towers east and three towers a bit higher up nearby and west. The 11th century ruins are definitely in need of a facelift and it looks like they may get one at s0om e point as a sign in front states that a project is underway. Unfortunately, the same sign has made the same announcement with no results apparent since a year ago when I last visited the site. 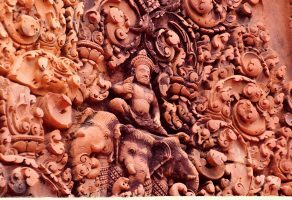 To get to Phnom Krom Hilltop Temple, just follow Sivutha Street south out of Siem Reap. The road follows the river for much of the way and road is in good shape for most of the short journey. You will arrive at the base of the hill after just fifteen minutes and there is an archway and stairway that you take up about halfway, which leads to the spot near the big gun. From there you follow a small road to the temple area. You can actually ride all the way up by going past the stairway, beyond the house and tree area, where you will see a long out-building off on the right side. Follow the small road that runs along side of the building and stay on this winding road to the temple area. There are drink and food stands at the base of the stairway to re-hydrate after the trip.